For other uses, see Lucky Dragon. Daigo Fukuryū Maru (第五福龍丸, F/V Lucky Dragon 5) was a Japanese tuna fishing boat with a crew of 23 men which was contaminated by nuclear fallout from the United States Castle Bravo thermonuclear weapon test at Bikini Atoll on March 1, 1954. The crew suffered acute radiation syndrome (ARS) for a number of weeks after the Bravo test in March. During their ARS treatment, the crew were inadvertently infected with hepatitis C through blood transfusions. All recovered except for Aikichi Kuboyama, the boat's chief radioman, who died on September 23, 1954, from an underlying liver cirrhosis compounded by the secondary hepatitis C infection. Kuboyama is considered the first victim of the hydrogen bomb and of test shot Castle Bravo. Built in March 1947 and launched from Koza, Wakayama, the boat was originally named Dainana Kotoshiro Maru (第七事代丸, Kotoshiro Maru No. 7). It was a bonito boat and moored in Misaki Fishing Harbor, Kanagawa Prefecture. It was later remodeled into a tuna fishing boat. In 1953, it moved to Yaizu Port, Shizuoka Prefecture, with a new name, Daigo Fukuryū Maru, translated as Lucky Dragon No. 5 or the Fifth Lucky Dragon. The Lucky Dragon No. 5 took five ocean voyages, the last of which began on January 22, 1954, and ended on March 14 of that year. The crew set off to go fishing in the Midway Sea near Midway Atoll, but when they lost most of their trawl nets to the sea, they altered their course southward near the Marshall Islands and encountered fallout from the Castle Bravo nuclear test at Bikini Atoll on March 1. A map of the varying location of the boat in the days leading up to and after the day of the explosion is available. On March 1, the map depicts the vessel very near to the border of the US Navy issued "danger zone notice" dated October 10, 1953. Following March 1, the vessel charted a practically straight geodesic course back to its home port of Yaizu, passing the same latitude as Wake Island between March 4 and 6 and arriving at Yaizu on March 14. The source of the map, does not state how the map was created, that is, it does not state that the ship's log was consulted in the creation of the map, nor does it provide the navigator's measurements with the compass and sextant of the period. The exact position of the ship on the day of the explosion is therefore uncertain. Contemporary references give a figure of "80 miles east of Bikini Atoll" without stating the method by which the distance was computed. According to a 1997 paper by Martha Smith-Norris, the ship was operating "14 miles" outside the 57,000 square mile "Danger Area", and it was not detected by radar or visual spotter planes. The Bravo fallout plume spread dangerous levels of radiation over an area over 100 miles (160 km) long, including inhabited islands. The contour lines show the cumulative radiation dose in roentgens (R) for the first 96 hours after the test. The Bikini Atoll. The Bravo crater is on the North West end of the atoll. 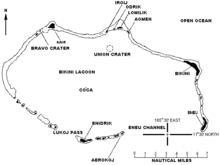 the device's firing crew were located on Enyu island, variously spelt as Eneu island as depicted in this map. The Daigo Fukuryū Maru encountered the fallout from the U.S. Castle Bravo nuclear test at Bikini Atoll, near the Marshall Islands, on March 1, 1954. When the test was held, the Daigo Fukuryū Maru was catching fish outside the danger zone that the U.S. government had declared in advance. However, the test was more than twice as powerful as predicted, and changes in weather patterns blew nuclear fallout, in the form of a fine ash, outside the danger zone. On that day, the sky in the west lit up like a sunset. Seven minutes later, the sound of the explosion arrived, with fallout reaching the ship two hours later. [better source needed] The fishermen attempted to escape from the area, but they took time to retrieve fishing gear from the sea, exposing themselves to radioactive fallout for several hours. The fallout – fine white flaky dust of calcinated Bikini Island coral, which absorbed highly radioactive fission products and neutron activated isotopes – fell on the ship for three hours.[when?] The fishermen scooped the highly radioactive dust into bags with their bare hands. One fisherman, Matashichi Oishi, reported that he "took a lick" of the dust that fell on his ship, describing it as gritty but with no taste. The dust stuck to surfaces, bodies and hair; after the radiation sickness symptoms appeared,[when?] the fishermen called it shi no hai (死の灰, death ash). Feeling ill,[not in citation given] the crew set sail to return to Yaizu on March 2, and arrived on March 14. Medical professionals, before the era of whole body counting, assessing the radioactivity of a bedridden crew member by using a geiger counter on 31 March 1954, focusing on the person's hair, which would have collected dusty fallout. Japanese biophysicist Yasushi Nishiwaki immediately traveled from Osaka to Yaizu to examine the crew and their boat. He quickly concluded that they had been exposed to radioactive fallout and wrote a letter to the chief of the US Atomic Energy Commission (AEC) asking for more information on how to treat the crew. The crew members, suffering from nausea, headaches, burns, pain in the eyes, bleeding from the gums, and other symptoms, were diagnosed with acute radiation syndrome and admitted to two Tokyo hospitals. On September 23, chief radio operator Aikichi Kuboyama, 40, died—the first Japanese victim of a hydrogen bomb. He left these words: "I pray that I am the last victim of an atomic or hydrogen bomb. "[better source needed] The US did not respond to Nishiwaki's letter or to letters from other Japanese scientists requesting information and help, although the United States did dispatch two medical scientists to Japan to study the effects of fallout on the ship's crew and to assist their doctors. Kuboyama Aikichi on 15 September 1954. Aikichi died on 23 September. The US government refused to disclose the fallout's composition due to "national security", as the fallout's isotopic ratios—namely a percentage of uranium-237—could reveal the design of the Castle Bravo device through radio-chemical analysis, with this information having a history of being regarded as potentially revealing the means by which megaton yield nuclear devices achieve their yield. For instance, Joseph Rotblat may have deduced the staging nature of the device by studying the ratio and presence of tell-tale isotopes present in the fallout. As of 1954, the Soviet Union had not yet been successful with thermonuclear staging and such information could have assisted in their development of a thermonuclear weapon. Lewis Strauss, the head of the AEC, issued a series of denials; he also hypothesized that the lesions on the fishermen's bodies were not caused by radiation but by the chemical action of the caustic burnt lime that is produced when coral is calcined, that they were inside the danger zone. He told President Eisenhower's press secretary that the Lucky Dragon #5 may have been a "red spy outfit", commanded by a Soviet agent intentionally exposing the ship's crew and catch to embarrass the USA and gain intelligence on the test's device. Later, the United States expanded the danger zone and it was revealed that in addition to the Daigo Fukuryū Maru, many other fishing boats were in the expanded zone at the time. It is estimated that about one hundred fishing boats were contaminated to some degree by fallout from the test. Despite denials by Lewis Strauss concerning the extent of the claimed contamination of the fish caught by Daigo Fukuryu Maru and other ships, the FDA later imposed rigid restrictions on tuna imports. At first, the US claimed that the extent of the Lucky Dragon incident contamination was trivial. Later, the United States paid Kuboyama's widow and children the equivalent in yen of about $2,800 ($26,100 in 2019). The tragedy of the Daigo Fukuryū Maru gave rise to a fierce anti-nuclear movement in Japan, rising especially from the fear that the contaminated fish had entered the market. The Japanese and U.S. governments negotiated a compensation settlement, with the transfer to Japan of a compensation of $15,300,000, of which the fishery received a compensation of $2 million, with the surviving crew receiving about ¥ 2 million each, ($5,550 in 1954, $51,800 in 2019). It was also agreed that the victims would not be given hibakusha status. The Japanese government pledged that it would not pursue further reparations from the U.S. government. The majority of medical experts believe that the crew members were infected with hepatitis C through blood transfusions during part of their acute radiation syndrome treatment. The longest staying crew member spent about a year in hospital following their return to port. Like the hibakusha, survivors of atomic bombings in Hiroshima and Nagasaki in 1945, the Lucky Dragon crew were stigmatized because of the Japanese public’s irrational fear of those exposed to radiation (it was commonly believed to be contagious). The crew tried to stay quiet about their exposure for a number of decades, beginning with their discharge from hospital. A number of the crew also had to move away from their previous places of residence to make a fresh start. Former crew members include the 87-year-old, as of 2014, Susumu Misaki, who opened a tofu shop after the incident. Twenty years old at the time, Matashichi Oishi, who is reported to have licked the mysterious fallout substance which fell on his ship in March 1954, as a taste test to ascertain its properties, was 79 years old in August 2013. After the exposure, he left his hometown to open a dry cleaning business. Beginning in the 1980s, he frequently gave talks advocating nuclear disarmament. In 2011, he published a book titled, "The Day the Sun Rose in the West: The Lucky Dragon and I." The Daigo Fukuryū Maru was deemed safe for public viewing and was preserved in 1976. It is now on display in Tokyo at the Tokyo Metropolitan Daigo Fukuryū Maru Exhibition Hall. The Toho Film Gojira (Godzilla, 1954), was inspired in part by this event. The ship itself appears on a poster in 2001's Godzilla, Mothra, King Ghidorah: Giant Monsters All-Out Attack, which also features Godzilla coming ashore and wreaking havoc in the Yaizu area. A poem, Japon Balıkçısı (The Japanese Fishermen), was written in 1956 by Turkish poet Nâzım Hikmet Ran about the events. Ralph Lapp wrote The Voyage of the Lucky Dragon, which was published in 1958. It was reviewed on the front page of The New York Times Book Review. A film version of the events, Daigo Fukuryū Maru (1959), was directed and screenwritten by Kaneto Shindo, and produced by Kindai Eiga Kyokai and Shin Seiki Eiga. ^ a b c "As I See It: Gov't must delve deeper into radiation exposure from Bikini Atoll incident". Archived from the original on May 24, 2014. ^ Richard Rhodes (August 6, 1996). Dark Sun: The Making of the Hydrogen Bomb. Simon and Schuster. p. 542. ISBN 978-0-684-82414-7. ^ "Castle Bravo: Sixty Years of Nuclear Pain". Archived from the original on July 7, 2014. ^ a b c d e f "Lucky Dragon No. 5 special exhibit". Archived from the original on October 10, 2008. ^ Nasaizumi, Research in the effects and influences of the nuclear bomb test explosions, Volume 2 Japan. Committee for Compilation of Report on Research in the Effects of Radioactivity, Japan Society for the Promotion of Science, 1956 - History - page 1281 onwards of 1835 pages. ^ "Only as Dust in the Face of the Wind": An Analysis of the BRAVO Nuclear Incident in the Pacific, 1954 Martha Smith-Norris The Journal of American-East Asian Relations Vol. 6, No. 1 (SPRING 1997), pp. 1–34". JSTOR 23612829. ^ a b Arnold, Lorna; Smith, Mark (2006). Britain, Australia and the Bomb. Palgrave Press. p. 77. ISBN 978-1-4039-2101-7. OCLC 76350829. ^ a b Leonard Engel, "Twenty-Three Fishermen and a Bomb; The Voyage of the Lucky Dragon", New York Times", February 23, 1958, p. BR1. ^ a b Hoffman, Michael, "Forgotten atrocity of the atomic age", Japan Times, August 28, 2011, p. 11. ^ "The Japan Times". March 1, 2009. Retrieved March 23, 2010. ^ Kyodo News, "Scientist immediately sought details from U.S. on 1954 Bikini H-bomb test", Japan Times, January 11, 2012, p. 2. Nishiwaki's letter, as of January 2012, was on display at the National Atomic Testing Museum in Nevada. ^ Michael Schaller (1997). Altered States: The United States and Japan since the Occupation. Oxford University Press. p. 72. ISBN 978-0-19-802337-1. ^ Derek Duke. Chasing Loose Nukes. Dungan Books. p. 9. ^ The Radioactive Signature of the Hydrogen Bomb. ^ Reiner Braun (2007). Joseph Rotblat: Visionary for Peace. Wiley. p. 188. ISBN 978-3-527-40690-6. ^ Schreiber, Mark, "Lucky Dragon's lethal catch", Japan Times, March 18, 2012, p. 7. ^ a b A. Costandina Titus (2001). Bombs in the Backyard: Atomic Testing and American Politics. University of Nevada Press. p. 49. ISBN 978-0-87417-370-3. ^ a b James Mahaffey (February 4, 2014). Atomic Accidents: A History of Nuclear Meltdowns and Disasters: From the Ozark Mountains to Fukushima. Pegasus Books. p. 105. ISBN 978-1-4804-4774-5. ^ Jadwiga E. Pieper Mooney; Fabio Lanza (January 25, 2013). De-Centering Cold War History: Local and Global Change. Routledge. p. 21. ISBN 978-1-136-18407-9. ^ https://web.archive.org/web/20110719155737/http://www.brookings.edu/projects/archive/nucweapons/50.aspx 50 Facts About U.S. Nuclear Weapons. Atomic Audit: The Costs and Consequences of U.S. Nuclear Weapons Since 1940. Brookings Institution. "Money paid by the State Department to Japan following fallout from the 1954 "Bravo" test: $15,300,000"
^ a b "Japan nuclear victims in 1950s 'guinea pigs' and 'Communists' 12 Jul 2011. Citing Dr Aya Homei 'Nuclear Japan and the Effects of Radiation, 1945–1960' journal, Historical Studies in the Natural Sciences". ^ "Victim of Bikini Atoll H-bomb fallout keeps the faith". ^ Ralph E. Lapp (1958). The Voyage of the Lucky Dragon. ASIN B0000CJZ45. Oishi, Matashichi (2011). The Day the Sun Rose in the West: The Lucky Dragon, and I. University of Hawaii Press. United States. Congress. Joint Committee on Atomic Energy, U.S. Atomic Energy Commission (1967). Hearings and reports on atomic energy, Volume 20 Hearings and Reports on Atomic Energy, United States. Congress. Joint Committee on Atomic Energy. Compiled by Melvin Price, Publisher U.S. G.P.O., 1957, Original from University of Chicago, Digitized Dec 16, 2010. 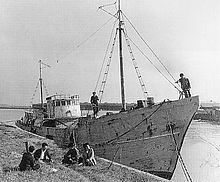 Wikimedia Commons has media related to Daigo Fukuryū Maru (ship, 1947).